Social media is constantly evolving. With big name influencers popping up every second & bloggers collaborating with huge brands, how can you get noticed? Whether you're a rookie blogger or a seasoned influencer, using strategic & authentic social brand mentions can give you the edge you need to move forward. What is a social brand mention? A social brand mention is the act of mentioning a brand or product on social media, be it Pinterest, Facebook, Snapchat. It can be anything from a quick shoutout on Twitter to a lengthy YouTube video. Here I checked into the location & mentioned the brand in my caption. They liked & commented on the photo. Why should I mention brands? 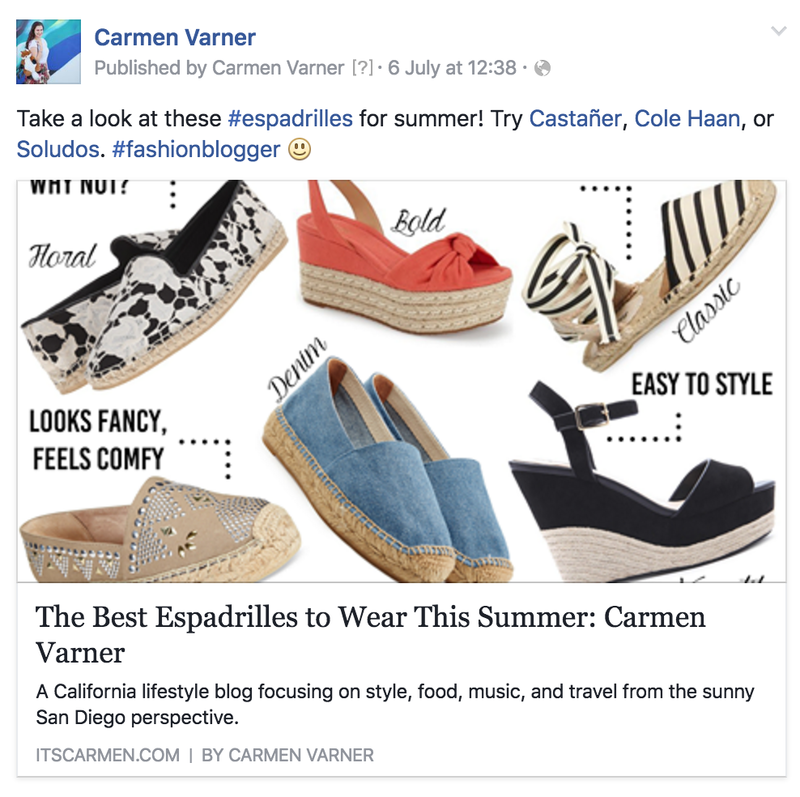 There are several reasons why you should actively & regularly mention brands throughout your social media & blog. The biggest reason is its benefit to YOU! Here I tagged brands within my update. Tagging a brand can help to expand your reach. When you mention a brand, tag them in a post, talk about a product, there's always the chance that the brand will engage back with you. They may like your post, repost it, share it, create a dialogue with you, or reach out to you for further opportunities. That's a good thing! Here I showed authentic excitement for a brand. They tweeted back, liked the tweet, retweeted it, & followed me. Specifically call out the products & brands you're using so your followers can get a feel of your true & authentic self. Your readers want to know what you're genuinely buying & enjoying. Show them! Here I posted a photo & tagged the brand. It gave me fresh blog & Instagram content. When you call out brands, you're creating original content for yourself. Integrating those social mentions can give you more to talk about, write about, & share. If you're struggling to come up with content, it may be as simple as talking about that deodorant you're really loving or that new coffee shop you visited twice this week. Here I talked about a product I enjoyed. 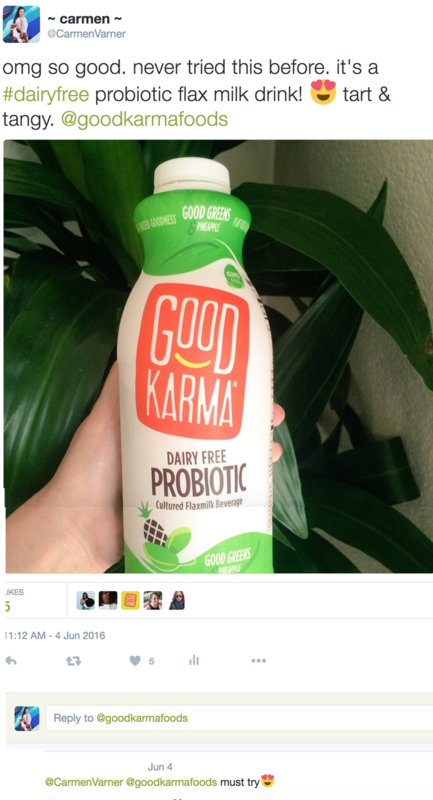 Someone tweeted back that they wanted to try the product. Establish yourself as an influencer by building authentic social relationships with brands & readers. Brands are always hunting for relevant influencers, & your online activity can be a huge part of someone else's offline & online decision making. Here I mentioned a product I'm loving, which gave me extra content. The brand liked the photo. At the very end of the authentic social brand mention chain is the potential to work with brands. 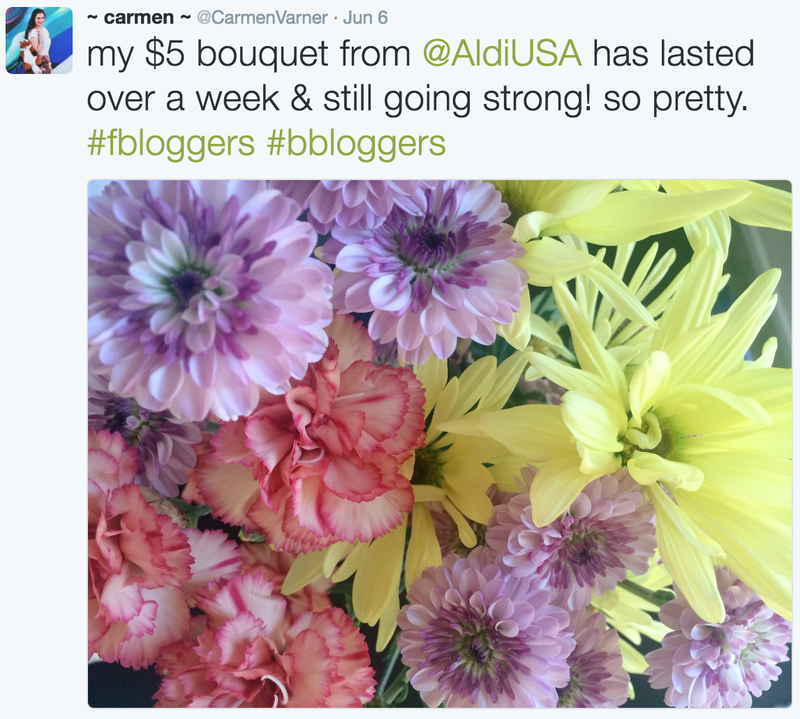 Sometimes the brand will retweet you or share your mention or blog post, which can expand your reach. Sometimes the brand will email you to say thanks. Sometimes the brand takes note, keeping you on their radar for future possibilities. Sometimes the brand reaches out to send free product. Sometimes, just sometimes, they want to work with you for a paid post or campaign. Hell yes! I reviewed a product on my blog in 2016. The brand reached out August 2017 to ask if I wanted free product. 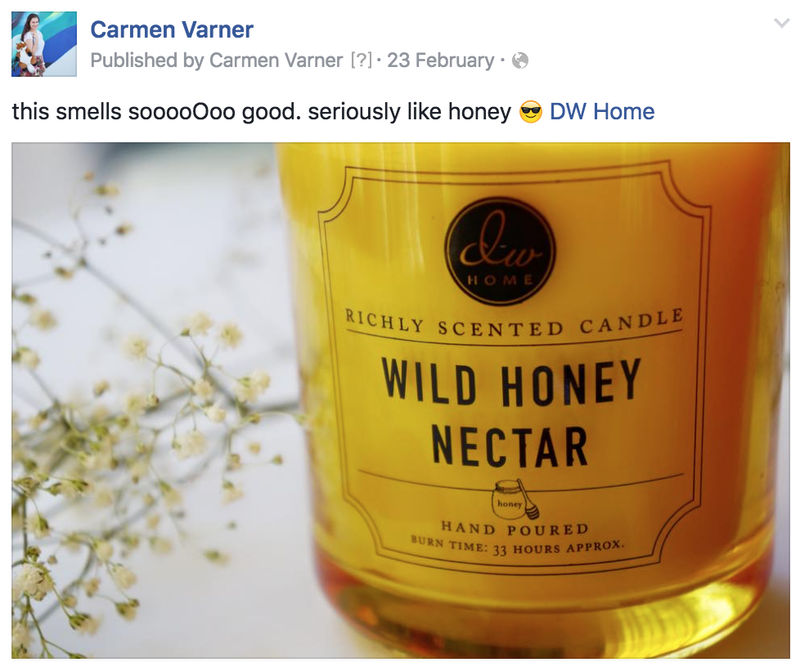 How can I create an effective social brand mention? Say you go out to dinner with your boyfriend. You really enjoyed yourself, so you tweet a photo of your meal & mention the restaurant. That's an effective & authentic social brand mention. Take a look at my formula for brand mentions. You don't have to do all five steps, but I recommend integrating at least three. 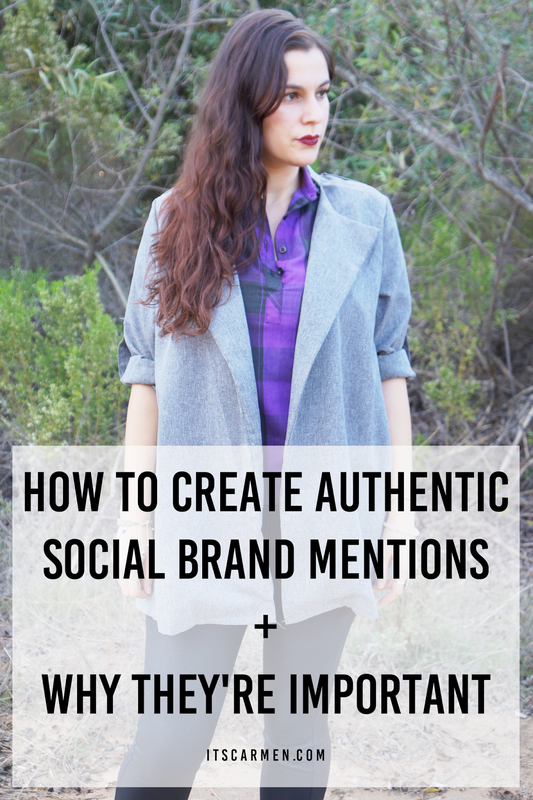 This contains the four steps needed to create an effective & authentic social brand mention. BONUS STEP 5. Send a quick email to the brand giving them a brief compliment & sharing the link to your brand mention. Creating authentic social brand mentions can give you the edge you need to move forward in your career, especially since it can expand your reach, give you the opportunity to discover new content, allow your readers to get to know you, & show your worth as an influencer. I love doing this! they usually RT my tweet, re-post my Insta photo and mention my name which as a result leads to more likes and followers :) LOVE it! Social media is so important if you know how to use them, thanks for posting this, it is so helpful! Doing this authentically is key. You've given great examples! This is such a helpful post! I like to mention brands as well, but I usually do it more on Instagram. I definitely need to start doing it on Twitter as well, thank you so much for sharing! Thanks for this! 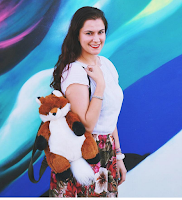 I'm not a super blogger by any stretch of the imagination (although, that's definitely a goal), but I JUST posted something about items that I bought and I was very anxious about it. This put a lot of my concerns to rest and you gave some great examples on how to talk about a brand frankly and positively without being preachy! This is such a good idea! I'm really glad I read this, I should start mentioning brands on social media. A great post about how to keep things authentic. I hope you're having an amazing day! great post and awesome tips!!! Thanks so much for the helpful tips! This is awesome. Have a great day! These a great and very helpful tips! I usually tag the brands but mentioning them I think is more effective! i remember the first time a brand commented on my post. i was like a giddy school girl. it's great to have your hard work recognized. your posts all look fabulous. These are all great tips! I notice that I get a lot more brands responding to me when I remember to tag them! Thanks so much for sharing love! Love these tips! Authenticity is definitely key when sharing. It is usually quite obvious when the person sharing the photos or posts clearly don't use the product or care. Great tips! You make it super simple.